With more and more students and travelers venturing into third-world countries for study and extended vacations, the unfortunate risk of theft is still too real to ignore. Thieves can strip you of your belongings without you even knowing it, and they can be long gone before you can do anything about it. With that in mind, Pac-Safe has been specializing in theft prevention for tourists since 1998. You may have read my glowing report of their fanny pack Stashsafe 200 some months ago, but on a recent trip to South America, I had the opportunity to test both their Pacsafe 85 backpack and bag protector as well as their RFID passport protector. One of the newest scams is taking place on overnight bus rides through remote areas. While you doze off in your bus seat, with your bag supposedly safe by your feet, young thieves crawl the floors and carefully unzip your bag, removing whatever valuables they can quickly locate. Then at the next stop, they hop off with a backpack full of passengers’ belongings. When you finally awake, your bag is still there, so unless you check it thoroughly, you might still not even realize your valuables have left the bus. The Pacsafe 85 quickly and easily prevents this latest scam as well as guarding your bag anytime you aren’t using it. It’s a smart steel eXomesh that expands to cover whatever size bag you need to protect. My backpack is a 3,500 cu. inch model, so I used the Pacsafe 85. There are smaller and larger sizes available depending on your needs. (Consult this chart to determine the right model.) See the video to see the steps needed to secure your bag. Total time once you’ve done it a couple times…about two minutes. The whole mesh and padlock only add one pound to your pack, but it packs a ton of protection when you aren’t actively carrying your bag. 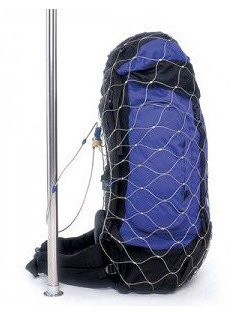 Not only does the mesh prevent people from pulling items out of your bag, the long, self-tightening cable securely affixes itself around any immoveable object, meaning you’ll find your gear where you left it. 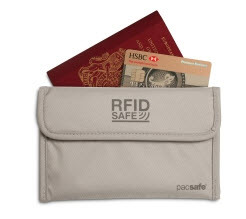 The Pacsafe unit comes bundled up in a compact storage pouch with a padlock and three keys. When I first received the Pacsafe unit, I was a little afraid this was going to be one of those “once you take it out of the box, you’ll never get it back in the same way” deals. Much to my surprise, even after using it multiple times, it consistently almost folds itself back into position, so you can easily repack it in the supplied case. On my first effort, it only took 1 minute and 28 seconds to completely unlock my bag, compress the Pacsafe and repack it in its case. Kudos to the Pacsafe engineers! I also used the RFID passport protector wallet to safely stow my passport, immunization records and credit cards. With the possibility of people being able to electronically grab your ID, you never know when the attempt is being made. Keeping it in a magnetically impermeable cover, the data just can’t be read by an unwanted RFID reader. It’s just large enough to hold your passport, but small enough to fit most any pants pocket or sleeve in your pack. Watch the video. You can find Pacsafe products at many leading outdoor stores or on their website.